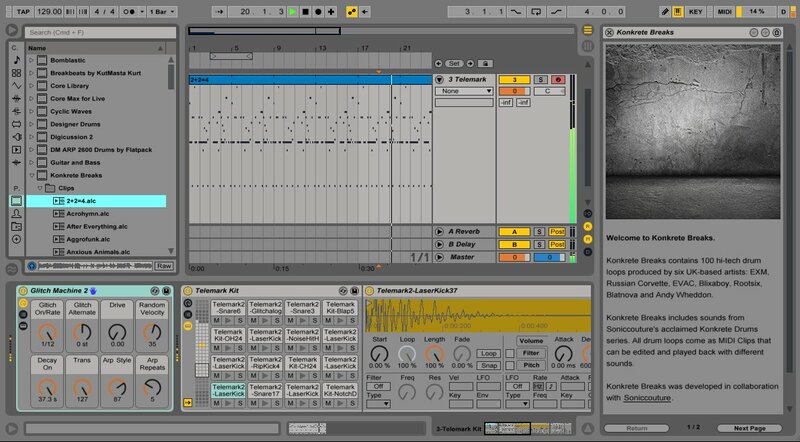 Ableton Live 9 comes with a number of exciting new sound packs, including Soniccouture's Konkrete Breaks. Featuring drum kits, individual samples, and MIDI breaks assembled by six London-based artists, Konkrete Breaks is a malleable set of drum sounds and MIDI clips that work easily in Live. We spoke to James Thompson, sound designer and co-founder of Soniccouture, about the making of Konkrete Breaks. Can you describe some of the methods that you used to create the sounds used in Konkrete Breaks? Buchla 200e synth | Metal playground | 9ft grand piano | Telemark synth | ebay drum kit (smashed) | Broken soviet drum machine | Circuit bent samplers | a Guzheng | Liepzig synth | Culture Vulture distortion unit | Rhodes Stage 73 | Contact mics | Physical modelling algorithms| Mobile phone codecs | Thunder Drum | Epson printer | Acoustic guitars | Washing Machines | Vaccum Cleaner Tubes | SledgeHammers | Vintage Phono Pre-amps | wire brushes | EMS Synthi AKS Synth | Eastern block audio test equipment | and many more. How does Konkrete Breaks work within Live 9? The fantastic thing about Konkrete Breaks is that you're not just getting audio loops. Even though Live works very well with audio, this steps it up a level and connects full drum kits ( 61 different drum sounds in each) with complex MIDI beats, Live devices and effects. The end result has been set up and produced in Live and is ready to use, but still completely open for the users to delve into and take it in their own direction. You can edit the beat into anything you want, modulate the effects over the course of a track - Konkrete Breaks are complete 'jumping off' points for modern EDM production. Can you talk about why you went with artists for the clip presets? When you're producing a collection of beats like this, you really want to get a good variety of flavours. Even thought the breaks are all EDM style, of course everyone does it very differently. By using artists were were able to capture the breadth and dynamics of different IDM styles. 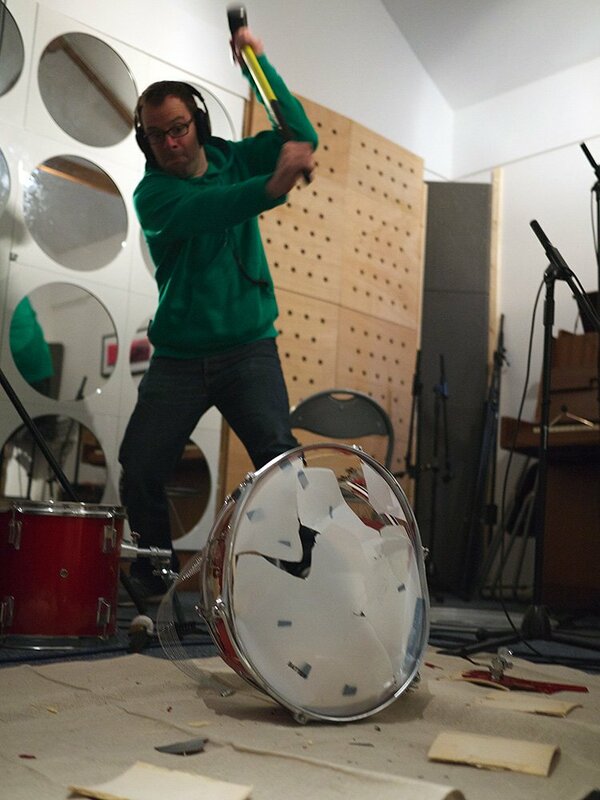 All the creation sound design of the drum kits was done in house by Soniccouture - that's our speciality, of course. Then by giving the sounds to a diverse group of artists, they were able to add their magic by sculpting the individual sounds into beats. Why did you pick the specific artists featured? In my spare time I like to do some mastering - it's a discipline I enjoy, because it's fastidious and craftsmanlike, yet also fairly quick, when compared to writing and recording music. One of the labels I do a lot of mastering for is Concrete Plastic, who have some really interesting IDM artists. It seemed a perfect fit to work with them on Konkrete Breaks. Elsewhere, I came across Russian Corvette after he contributed to Analog Industries Vinyl project, and loved his stuff, so wanted him to be involved. Evac is a SC collaborator who's style is very technical and slick, so he seemed a great fit for this project too. Lastly, can you tell us a bit about Soniccouture and where you'd like to go with Live? Dan Powell and I started Soniccouture in 2005. We had both previously worked as sound designers in the music industry. After finishing one of our projects, we realised we had a lot of material left, so we decided to release it under our own name. That was the start of Soniccouture. In the first few years of the company we decided to stay away from the traditional sampling areas - drums, pianos, loops etc - and look for unusual instruments that hadn't been sampled in detail yet. We figured this might be an interesting direction for the business to take. This proved to be very much the case, and with the release of Hang Drum ( now known as Pan Drum) in 2007, our 'signature style' of sampled instrument was born. We gained a good reputation from this and subsequent releases, and these days thousands musicians depend on us to bring them unusual sounds in innovative, creative instruments. SC started working closely with Ableton in 2010, bringing much of our instrument range to the new Live Pack format when it was launched. Since then our relationship has strengthened, and we work closely with Ableton's sound department, either advising or developing new ideas with them for future Live Packs. We hope to have something interesting to bring to Push very soon!